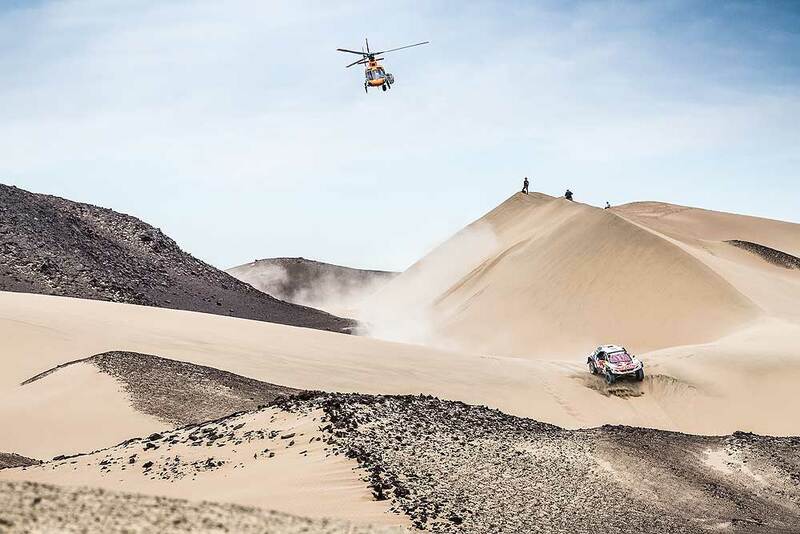 The proper Dakar action started Sunday, with the drivers launching into the first long-distance stage of the Dakar, covering 278 kilometers around the Peruvian town of Pisco. The scenery consisted of dramatic desert landscapes with big sand dunes, as well as stunning views of the coast, with 90% of the action being off-piste. In these challenging conditions, many competitors fell by the wayside: But not the Peugeot 3008DKR Maxi crews, who finished first, second and third – with two of the French cars now in the top two places overall. Cyril Despres won a stage for the second time in his Dakar career: A feat that was as much down to the skills of his navigator David Castera, who managed to guide them through the complex terrain without getting lost. They now lead the rally overall from their team mates Stéphane Peterhansel/Jean-Paul Cottret. 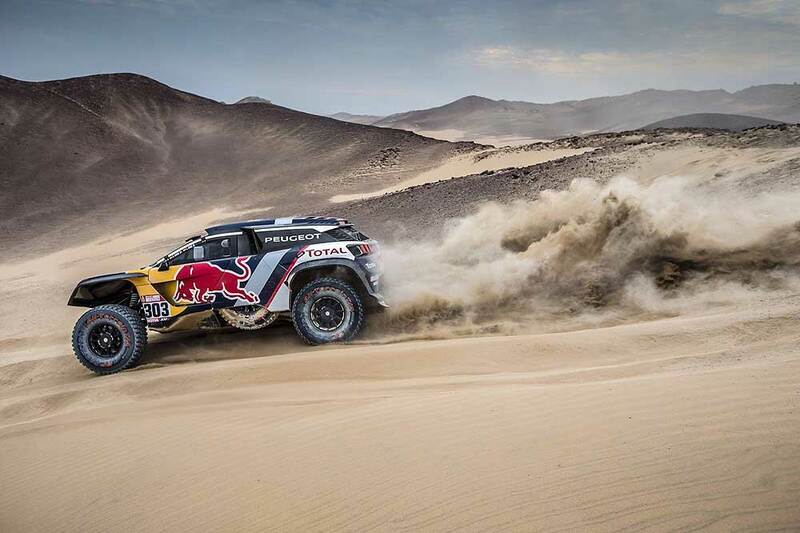 "It was a difficult stage as the dunes were quite high, both going up and going down," Despres told after the stage. "There was also some very soft sand: we passed three or four cars that were stuck and we saw a couple of accidents. But these are the sort of hazards that you just expect on the Dakar. It’s the first time that our Maxi has come to these wide open, spaces in competition – which you don’t really find in testing – and the car is working very well. David too did a great job with the navigation and wasn’t caught out by all the different tracks from the previous cars. Our strategy seems to be a good one so far, but tomorrow is another day." Last years winners Stéphane Peterhansel and Jean-Paul Cottret had a neat day in which they were second on the stage and now also lie second overall, just under half a minute behind their team mates. "It was a good day for us but not a perfect one: we had to go back three times to find the waypoints, which cost us a few minutes," Peterhansel said. "Apart from that it was a nice stage with some big dunes, lots of driving off-piste, and some beautiful scenery along the coast. The navigation was definitely the trickiest bit, but I prefer stages like these ones rather than those of yesterday: these are proper Dakar stages. We’ve shown that we’re in the fight." Just off the overall podium but fourth in the general classification are former WRC-champion Sébastien Loeb and his navigator Daniel Elena. They completed the Peugeot top-three lock-out of the stage times and are now moving rapidly up the leaderboard, with a car that was perfectly reliable. "Today was definitely better than yesterday," said the Frenchman. "On the whole, it was a pretty good stage for us; we lost a bit of time looking for waypoints on three occasions, but I reckon everyone had the same problem: it wasn’t easy on this stage with complicated navigation. Peru is all about getting through the stages without losing too much time and for now we’re doing that with a reasonable pace through the dunes, which isn’t where we are strongest. The car worked well on what was a very complicated stage with lots of places to catch you out." Carlos Sainz and Lucas Cruz were hindered by Lucas feeling unwell, but under challenging circumstances they recorded a top-six finish on the stage to move into the top 10 overall, despite having to change two wheels after the tyres came off the rim. "The stage started quite well, we were quite fast in the beginning," Sainz said. "We caught and passed Cyril, but then we thought we had missed a waypoint, so we turned round and lost a bit of time. Then we caught Seb, but we also had a tyre come off the rim twice during the stage. At the end, we were lost again looking for a waypoint so we had to drive around a bit and dropped more time. It was a tricky stage, especially for my co-driver Lucas, who was sick, but we got through it."